Vice President Mike Pence laid out preliminary plans for President Trump's proposed new "space force" during remarks at the Pentagon on Thursday. Mr. Trump officially directed the Defense Department to establish this sixth branch of the U.S. military in space in June, saying the space force would ensure American dominance in the final frontier. "To be clear, the Space Force will not be built from scratch, because the men and women who run and protect our nation's space programs today are already the best in the world," he said. Assistant secretary of defense for space: A new position that will help transition eventually to a "fully independent Secretary of the Space Force in the years ahead" who will report to Secretary of Defense Mattis. While Pence says the the administration aims to have the sixth branch formulated by 2020, the establishment of a new military branch to oversee war fighting in space would require congressional approval. Mr. Trump, however fully endorsed Pence's speech, tweeting a resounding "Space Force all the way!" after the vice president's remarks. And while space fans will have to wait a bit longer until congressional approval, the Trump campaign has already sent a call out to supporters asking for their help in selecting the space force's official logo for merchandise on the Donald J. Trump for President reelection campaign site. The proposed sixth branch of the U.S. military will "confront the emerging threats in the boundless expanse of space" according to Pence. Why do we need a "Space Force"? 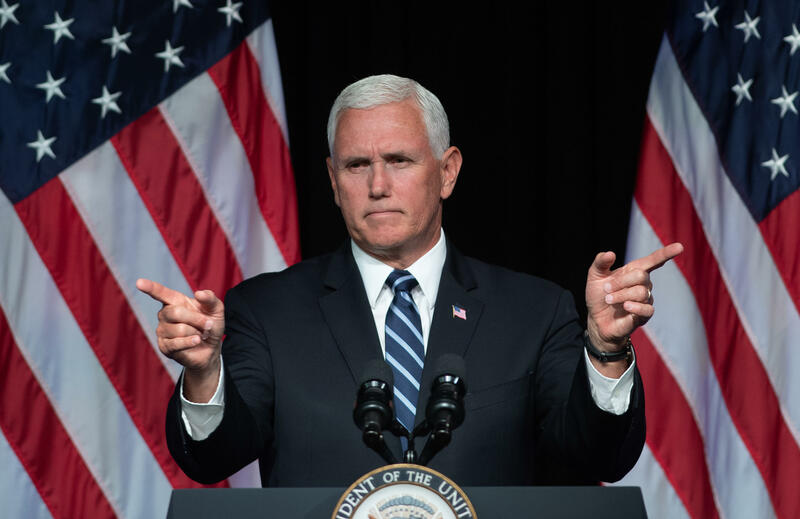 "The U.S. Space Force will strengthen security, ensure our prosperity and it will also carry American ideals into the boundless expanse of space," Pence said Thursday. Pence said that the new military branch will be needed in order to protect American national security as the "space environment has fundamentally changed in the last generation." "What was once peaceful and uncontested is now crowded and adversarial," said Pence. He added, "America will always seek peace, in space as on the Earth. But history proves that peace only comes through strength. And in the realm of outer space, the United States Space Force will be that strength."